OPSLAB is basically an online platform where one can create their own data handling applications without the necessity of programming and coding a web app. The application presents an interactive framework in which the user can upload data, view and analyze it online and save it for future reference. 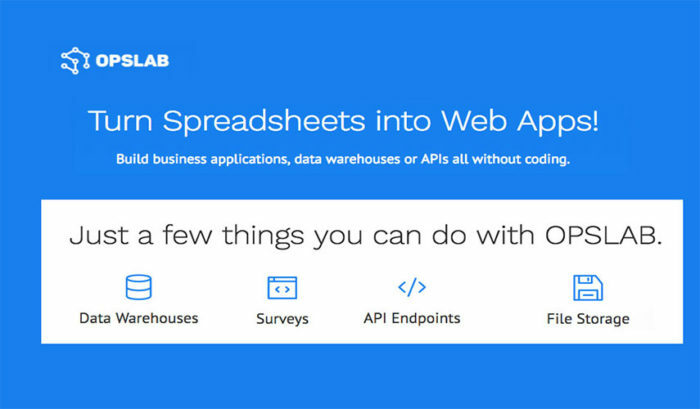 The app is basically an online spreadsheet with augmented features such as SQL database storage. This app is revolutionary in the field of data entry and processing and is aimed at making it easier to manage data and online for security purposes. OPSLAB enables one to create a personalized data management application for commercial use in data analysis. Moreover, it offers storage space for personal data and retrieval at the owner’s disposal which is achieved through generation of detailed reports from the data warehouse. The data can be drag-dropped or uploaded from an excel spreadsheet, or imported from any other storage location. The data warehouse is also capable of storing large files including music and video files. It has a ‘REST API'(Representational State Transfer Application Programming Interface) that controls the user’s web or mobile applications interactivity and it also enables a user to access uploaded data instantaneously. Furthermore, the app offers an SQL database storage for storage of a web applications’ data in which data from other web pages can be stored and manipulated. In addition, one can design a web survey form, commonly used as questionnaires, and use it to collect data. First, data handling on the app is swift and easy. Spreadsheets containing lots of data adjust to encompass all data values and present neat and readable reports. Since the user can analyze the data to give desired information, it offers considerable ease in terms of usability. Second, since OPSLAB offers database solutions for web and mobile applications, it minimizes on the monthly cost that owners incur on web hosting services and makes it easy to access the records on their database just by the click of a button. Moreover, OPSLAB offers a fast reply customer service available to a user always in the chat icon with a reply to a problem granted within a short span of time. Lastly, data security is essential in handling of sensitive data. A user has to create a personal account before accessing its services and since it offers cloud storage of data, loss or corruption of data is almost impossible. The web applications development is inflexible since the user has to use only the provisions offered by the site in the process. The data editing and formatting tools provided are limiting and in no way comparable to other applications such as MS Excel. In addition, the SQL database offered doesn’t support modern APIs for data protection such as password encryption and decryption. Also, data access could be limited if the user’s internet coverage is not reliable and hence causing inconveniences. Since the user requires additional APIs to connect an app with the SQL database, its tedious and costly and a normal web server would be better. In a nutshell, with the protected framework of the app and advanced data organization features, its apt to say that it is splendid. However, even though it is a great application with an awesome user interface, it lacks advanced features for data analysis. Its online, its safe, its fast but I would only recommend usage for people and organizations handling small amounts of data. For website developers, if the desired database is to be a simple one with no extra-sensitive data such as credit card details, i would recommend OPSLAB since it would offer a simple interface for storage. HR PARTNER- GO PAPERLESS ! Today, finding ways to save time and increase efficiency in an organisation is just like finding money on the ground. Everyone finds a shortcut to do work these days. Especially if you work in human resources, as a busy HR employee, you already know the importance of keeping employee records and personnel files. Keeping paper files can be an administrative nightmare and puts a lot of pressure on the employees. So when you’re living in this 21st century, then why do you feel so stressful? Go digital with this new partner called ‘HR Partner’. HR partner is an easy to use cloud software to keep your HR all in one place. The software is currently available on the web and offers a 14-day free trial to use it. It’s a simple HR software for busy HR professionals and employees. It’s an easy to use software, I really mean it when I say this! HR Partner helps you save time with employee onboarding, performance reviews, leave and absence management, reports, timesheets, grievances, and much more. You can even store company documents and procedures in seconds. Now eliminate HR bottlenecks so that you can keep everything all in one place and focus on what you have to do for empowering your people. Firstly, it’s easy for you and your employees to use this software on any device. So whether you are generating easy HR reports, setting up a reminder or sending out company wide announcements, HR partner will help you avoid costly and time-consuming pains like unnecessary spreadsheets, paper files and missed deadlines. It’s never been easier to offer employee self-service. But with HR partner, your employees can easily edit their profiles from any device and access important documents like company handbooks and manuals. You can store countless things like name, job title, department, salary, start date, birthday, address and much more in the cloud very safely. There are regular backups to ensure your data is never lost. If you want to give other managers access to their employee’s digital personnel files, then you can invite them and easily control what they can see and can’t see. You can easily access employee records on your mobile phone and any other device. If you have any urgent news to share with your entire company or with a particular department. You can send the information via email or text message within a few minutes. Just want to track company’s assets? No problem guys!When an employee rents something or any other company asset, you can record a note in HR Partner and set a reminder so that you know when it’s achieved. Remember, your goal is to always keep your employees happy. So HR partner lets you remember the things that really matter, including birthdays, performance reviews and other important dates. If you want to make your like easier than before and want to streamline your company’s HR bottlenecks, start saving the records digitally. 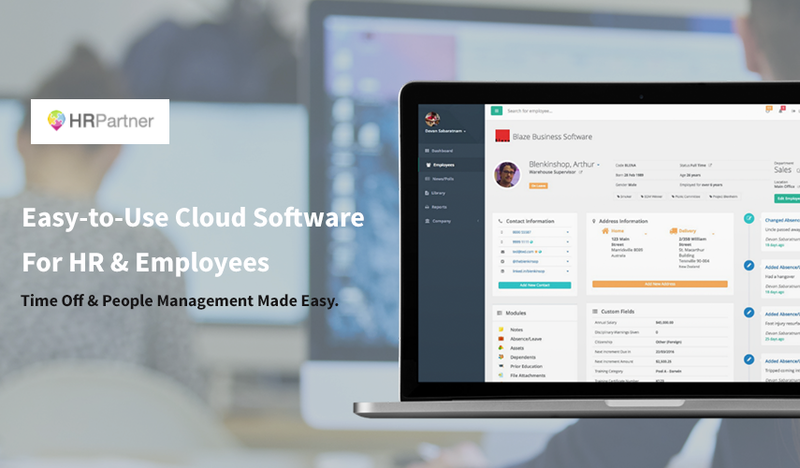 So if you’re looking for a way to handle employee record management in the cloud by saving time, HR Partner is the best solution. Say Goodbye to Spreadsheets, Paper files and Lost data! Try it now! You can request a demo on its webpage and start exploring it! Pros: 100% online & in the cloud; safe and secure; regular backups; saves time; avoid costly mistakes; management and employee-friendly; support in multiple time zones; free. Time is the most valuable natural resource every business, it employees and indeed everyone has been granted. It is also the most easily depleted because once spent, it cannot be reused or replenished. Time management is therefore an important function for every business and everyone who intends to make meaningful strides in their life. It is for this purpose that Clockodo was developed. Clockodo is a time management app developed specifically to address the time management needs of small business enterprises (SME’s) and those of freelancers. Developed to be quick, simple and reliable, Clockodo is an effective replacement for the traditional time management software such as Microsoft excel and other traditional methods such as time stamp clocks. Clockodo is a really easy to use app and anyone can learn to use it on their own without any need for further training. It has an interactive interface that directs the user on where and how to enter data. The application can be used on a computer web browser, a downloaded computer application or a smartphone application. This makes it both easy to access and easy to use. Being online based, users have access to the application and can log in from any place of their choice. Company employees can log in from the office, from home or from virtually anywhere where they have access to the internet. For this reason accurate data can be entered at any time from any place, making it easier to track the progress and the dynamics of a project. One can see just how much time has been spent on a project, any interruptions incurred and just how much time those interruptions took. Employees vacation time and their working hours can be easily analyzed with the app. This makes it effective for planning and budgeting, enabling the management to accurately determine just how long a project may take and the resources required to see it through. 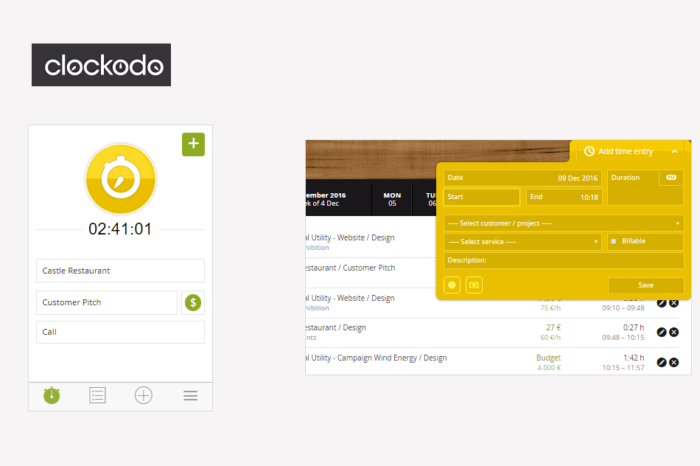 Clockodo has diverse uses and is not only a time management application. work reports can be entered on the application for easy access and analysis. This eases the management’s work and allows them to carry out management functions seamlessly, without having to micromanage employees. Data entered on the application is absolutely secure as it is duplicated in several servers which act as back ups in case of a breakdown. This means that individuals and companies can access their data at any time even when their systems have broken down. The application offers a 99.9% guarantee that owners will always have access to their data. Clockodo is not a free application and users have to pay a monthly fee to use it beyond the one month free trial period. It charges $8 for the first user per month and $5 for additional users. For SME’s with multiple employees, this sum may add up to quite a bit. While Clockodo is pitched as a multilingual application, it is currently only available in two languages; English and German. This may present a challenge for non-German or English speakers around the world. For the freelancer who works from home, and for the small business which must manage its time in the best way that it can, either to break even or to stay afloat in a rough environment, Clockodo is a necessary tool. Its benefits far outweigh its disadvantages as it ensures efficiency and will ensure personal, professional and business growth.